As someone who grew up in Harrisonburg, I spent many a childhood afternoon and weekend enjoying the public parks the city offered. 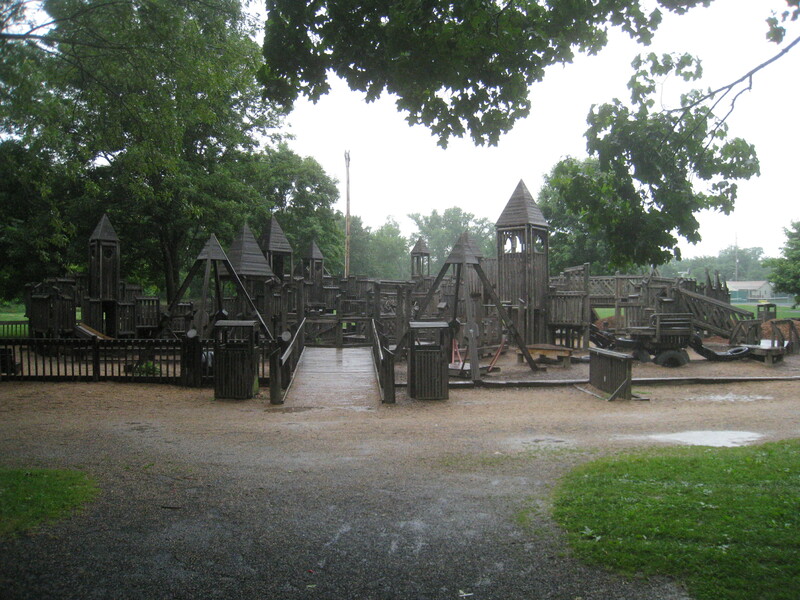 However, around the age of ten, the city constructed a new structure in Purcell Park called Kids’ Castle. Made primarily of wood, with a few bits of metal and rubber, the place was absolutely fantastic. Without a doubt, it was one of my favorite spots and so I often begged my parents to take me there. Several weeks ago, I got together with a friend who lives near Purcell Park and so I suggested taking a walk through the area. Although I had visited the park several months prior, this time I took the opportunity to return to my childhood destination of Kids’ Castle. Unfortunately, what I discovered was very distressing; the wooden structure was falling into disrepair. Many of the metal surfaces had begun to rust, some of the boards were exceedingly worn, a few nail ends were visible, ready to pierce the hands of unaware children, a tire bridge was actively disintegrating, and a handful of weeds grew up through the gravel. Although it was beginning to rain, I toured a bit of the castle and nearly fell on an exceedingly slippery piece of wood. It was as if Kids’ Castle had been more or less forgotten, abandoned these last 22 years. I brought up this matter during the public forum of the next meeting of the Harrisonburg City Council. Reaction from the council was mixed. For example, Council Member Chenault mentioned that a newer park, A Dream Come True, over on the west end of the city was built to replace Kids’ Castle and given the sorry state of the facility, it might be best to tear it down. After the meeting, I received an email from Council Member Degner and a phone call from Council Member Shearer; due to these contacts, I also spoke to the manager of Harrisonburg’s Parks and Recreation Department. Yesterday, I was featured on WHSV TV-3 to briefly speak about the matter. That segment, which aired at 11 PM last night, can be found at this link. It is my great hope that Kids’ Castle can be repaired so that the present and next generation of children can treasure it as much as I once did. And, assuming I ever experience the joy of children of my own, I’d very much like for them to have a wonderful and nearby place to play outside, a recreational option that is much healthier than the hours of television or video games that parents increasingly rely upon these days. So what will happen next? Well, as a result of the city council meeting and the reporting of WHSV, I’ve been told that the city is planning to repair much of Kids’ Castle by the end of July. It is excellent news. It is time to reclaim Kids’ Castle! 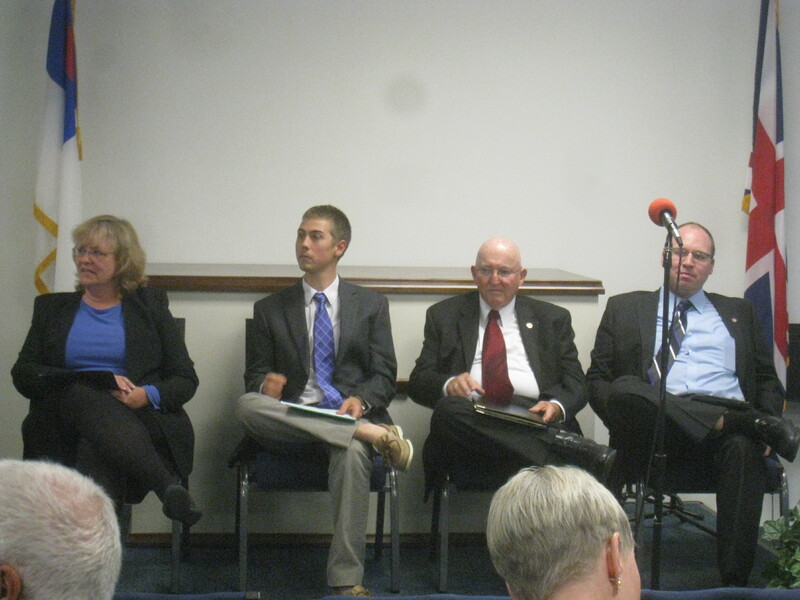 Last night, the Harrisonburg City Council held their bi-monthly meeting. As I sat in my chair waiting for the 7 PM start time, one of the regular attendees leaned across the aisle and told me that he saw me on the TV speaking about the city owned golf course. He went on to say that the golf course was here to stay and that city parks and recreations were not in the business of making money. I agreed that parks weren’t designed to turn a profit and asked him if he knew of any privately run parks in the area. Neither of us could name one. However, I then countered that golf courses can be a source of revenue and asked if he knew of any privately run courses. He said that he didn’t know of any and, at that point, I realized discussing this point further with him would not be particularly useful. 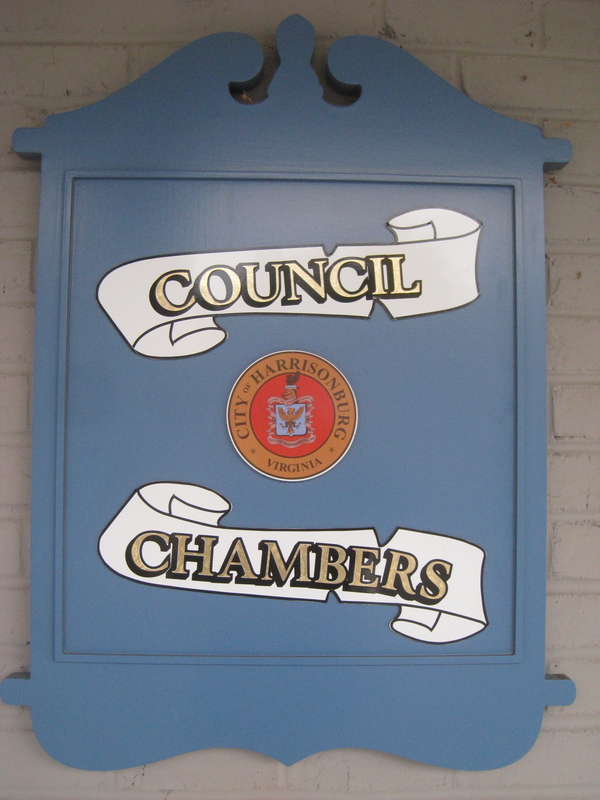 Anyway, as for the official council meeting itself, most of the event was business as usual, such as the time for public discourse and discussing tax exemptions for a charity. However, things got a bit more interesting when the subject shifted to energy efficiency in the city. Recently, the city has been considering the idea of improving energy efficiency in its buildings, a commendable idea as it will likely provide a significant savings to city taxpayers. As a result, Council Member Kai Degner crafted a deal with a company who specializes in this kind of work to make these improvements. However, the city manager declared this action was quite irregular as normally these issues are typically explored by the city staff, bids are accepted from a number of companies, and then the council picks the option that they feel best suits the city. Although it is good to see Kai Denger working hard on this issue, given that neither the majority of council nor the Harrisonburg staff seemingly had a hand in this company’s selection, if the idea moved forward, it could bear the stain of crony capitalism. Harrisonburg Mayor Ted Byrd argued that in the interests of the free market, the council should not simply accept the company of Degner’s choosing without considering other avenues. When Degner proposed going ahead with the desired company, it seemed quite likely that the vote would fail. This fact is significant because, of the multitude of council meetings that I have attended over the last six months, not a single proposal had failed nor had the vote been anything but unanimous. Cognizant of such a possibility, Council Member Degner revised his proposal to allow other companies to bid for this contract as well. At this point, Council Member Abe Shearer raised a new point. Why should the council only allow companies who offered a money back guarantee for their work to bid for this project? If the council could find a company with a good reputation who did not have such a guarantee, and at a considerable savings, shouldn’t they have the same chance to offer their services as well? Vice Mayor Charlie Chenault seemed to disapprove of that idea. In the vote that followed, Degner and Chenault approved the revised plan, as did Council Member Richard Baugh who declared that he was satisfied with this compromise. Although clear that the measure would pass despite their objections, both Mayor Byrd and Council Member Shearer voted no. As mentioned, I’ve attended quite a few council meetings as of late. However, last night marked a first, the first time that I was proud of my council for voicing my shared concerns about a fair and open process, for supporting the ideals of the free market, and for demonstrating that they are more than a monolithic group, a rubber stamp for any and every proposal that is presented to them. Returning to an earlier subject, last night gave me hope as well that the council might one day jettison the golf course, realizing that its public ownership is not a proper function of local government. I appreciate Council Member Baugh for not simply accepting the first proposal as stated. However, I write this post especially to praise Mayor Byrd and Council Member Shearer for their firm stands at Tuesday’s meeting. Besides the three federal positions that Virginians will elect in November, citizens of Harrisonburg, Virginia will also choose members to serve on city council. This year, three of the council’s five seats are up for grabs. There are eight candidates vying for these positions. The three Democratic candidates are: two current council members Richard Baugh, who also serves as the current Mayor of Harrisonburg, and Kai Degner, a realtor, as well as Deb Fitzgerald, an associate professor of economics at Blue Ridge Community College. The three Republican candidates are: Christine Johnson, the owner of the University Outpost Bookstore, Anthony Bailey, the Assistant Commonwealth’s Attorney, and Rodney Eagle, owner of Eagle Carpet and former Harrisonburg Mayor. The two independents are: Abe Shearer, a math teacher at Skyline Middle School, and Roger Baker, the former City Manager of Harrisonburg. Now, unlike most federal or state elections in the Shenandoah Valley, city council seats are not a virtual lock for any particular political party or individual. For example, on November 4th, 2008, the three Democratic candidates swept all of the seats besting three Republicans and two independents including both Rodney Eagle and Roger Baker. One should note that Barack Obama also won the city that day. In 2010, the next time seats were available; there were six candidates running, two Republicans, two Democrats, and two independents. In that election, one Republican and one independent emerged victorious. However, as was the case in 2008, I would expect the outcome of the city council race to hinge heavily upon the up-ticket races, especially the presidential. Left untouched, there will be a large number of voters who will be heading to the polls solely to vote for or against Barack Obama. I assume that they will know little, if anything, of the council candidates and will end up voting for all of the Democratic candidates if they support Obama or for all of the Republican candidates if they oppose him. As a result, I would argue that the two party candidates enjoy a significant advantage, but also a distinct disadvantage, when it comes to their independent opponents. If their presidential candidate does well, then that result should bolster their chances of victory. Conversely, if their candidate does poorly in the city, then it will make their success all the more difficult. At this point, any of the candidates should have a reasonable chance of being elected. But a strong campaign is a critical element that ought not be neglected. Should a candidate surround him or herself with competent advisors, have a strong organization for fundraising, a base of volunteers loyal to the candidate, and a coordinated plan for voter contact and organization, he or she should do well. On the other hand, as stated earlier, should a council candidate rely heavily upon the outcome of the presidential race and party activists, trouble could be in store. If the winds of fortune favor his or her party’s presidential nominee, he or she ought to do reasonably well. But, if national current runs contrary, and the candidate makes little independent effort on his or her own, he or she shall be destroyed. All voters in Harrisonburg owe it to themselves and their fellow citizens to educate themselves about their eight choices for city council. Sure, it might not be as glamorous or high profile as the well-known races, but I assure you that the men and women we select to help run the government of our city will make a tremendous impact, either for good or ill, upon all of us.